Sensitive is an understatement for my skin. It has always just been super delicate and always slightly rosy. Again, I some how missed out on the jackpot olive skin tone gene we Italians are suppose to have, and instead, have the ivory and problematic-to-the-touch skin tone. Awesome. After getting a full-on lecture from my dermatologist (also known as 'the skin whisperer' by Glamour Magazine) on using harsh beaded face washes and rubbing, instead of patting, my skin dry..... she suggested going a more natural route for my beauty routine. And when she whispers.... I listen. That woman is a miracle worker. WARNING - This will smell like death. Don't curse me when it does. You'll get over it when you see how gorgeous your skin looks. 2. Shake well. Wash face and use a clean cotton swap to apply. Then apply a gentle/unscented moisturizer. 3. Store in a cool, dry area. Some people are known to keep it in their refrigerator. Since this ACV contains no preservatives, make a new mix ever couple of weeks to be sure it's fresh. - I know, I know. Apple Cider Vinegar's holistic methods for anything and everything have been around forever and I, apparently, am the last to listen to any of them. I'm stubborn. - I've read that some people also add asprin tablets, witch hazel and green tea. Those are also great natural options to consider if your skin requires any of their added benefits. - My skin has never felt cleaner or looked fresher! I'd like to know who even thought of putting this stuff on your face to begin with. 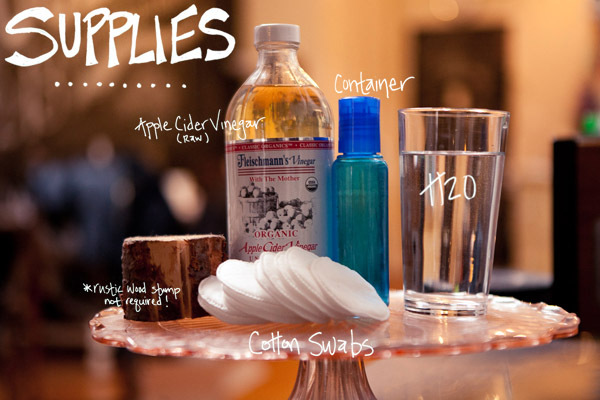 So do share, how do you use ACV? Have you used it as a skin toner before? What are the best ACV uses?